I am particularly interested in Japanese photography like that of Sugimoto with his references to transcendence and altered states of consciousness. Also Moriyama’s stark black/white images of streaks of light like scratches on a black surface and the potential for portraying terror and the uncanny. I find Rothko’s abstract paintings evoke a deep feeling of meditation and unreality. I also enjoy the drama of Turner and Martin’s vortex landscape paintings with their contrasts of colour and light. I wanted to use a motorhome holiday in the Lake District to get the images for this assignment. Although I had a rather vague idea of how I might produce sublime images like those of Sugimoto, Moriyama or Rothko, I did not start out with a clear idea of exactly what I would do because I knew much would depend on the weather. I wanted rather to see what came up, and maybe develop some new directions of my own. I started by doing a search for images of the Lake District by other photographers and compiled a page of links that I could refer to. Most of the images on Google or Flickr are sunny images of views from the tops of fells, often over-saturated with a lot of processing or filters – picturesque rather than beautiful. Some images like those of Brian Kerr, however I found beautiful with misty lakes and skeletal trees. Like another world. Ideas for ‘beautiful’ but nothing bleak or towering enough to be sublime in the way I wanted to portray things. I had initially intended to go walking – armed with Wainright’s Walks and walking boots. And we had planned to stay on Derwentwater, But on the way up to the Lakes my partner (the only driver) twisted his back and all the Derwentwater campsites were full. So in the end we stayed at Troutbeck and I was constrained to the area just around our Camper Van for three days. However the view from just around the van had more than enough to inspire me. The first day the campsite staff apologised for the weather – but the swirling fog and clouds over the mountains with shafts of light through the occasional cracks was much more ‘sublime’ than sunshine. In the image top and below I was trying to get a minimalist Rothko feel of veils over the unknown. Staring through the viewfinder at cropped slices of the scene gave a feeling of disorientation. The occasional crow added a sense of menace and foreboding to an almost volcanic scene. Then the clouds started to disperse over cracks of light. Then looking in the other direction there was the sun coming through over a round tumulus still wreathed in volcanic clouds. Although shot in colour these almost monotone images looked better in black and white, though I might experiment more with different tones. 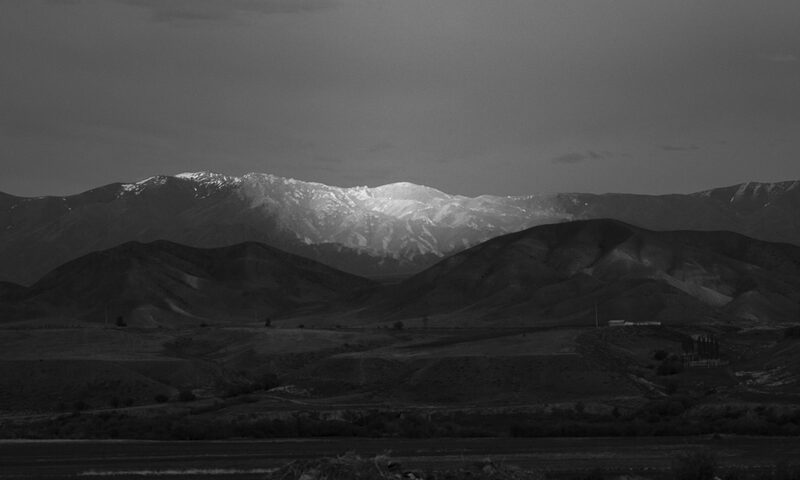 I also want to process them more with Nikon Silver FX to get more localised contrasts. But on the whole I feel these images – due to a happy accident of the weather – do convey a movement through different concepts of the sublime – altered states of consciousness, the uncanny, foreboding, to transcendence. A constant element in the sky were the streaks of plane smoke like comets. Echoing Sugimoto’s interest in the beauty of technology. Plane trails have always fascinated me – where are all these people going? But then also the fear of growing global warming. Above was evening. Below are similar trails at dawn. But here they are subtle marks on the pink sky. Now moving more towards the beautiful – promise of a sunny day. I like the classical curves of the tree and hill, like a wave on a Cretan or Roman vase. I left the big expanse of sky at the top to draw the eye into the universe beyond. Despite the cliche, the Lake District is also really beautiful when the sun comes out. Some of this feeling of beauty is instilled by romantic nostalgia of some time past that never really existed. But some, I think is hardwired pleasure at colours, sunshine and longing for peace and quiet to rest. The grass is brilliant green after all the rain – here it is the colour that is beautiful. In this ‘picturesque’ rather conventional image I follow compositional rules of division of thirds, the sheep looking at the viewer on the left is on an intersection, then lots of diagonals and leading lines. ISO 400, f22, 1/80 sec I wanted a deep depth of field here, and the sheep were not moving much. I would have liked more texture in the middle ground grass, but I guess that was just not possible without different lighting. This patch of seedheads (knapweed? not sure??) was special in the way the sun shone through the silken hairs fluttering in a gentle breeze. Here the beauty is in the feeling of lightness and joy, some ancient contented idyll that must be hard-wired in the brain. It was almost possible not to hear the cars on the road behind. ISO200 f/22 1/80 second. Probably here I should have increased the shutter speed so that more of the seedheads were sharp – they were moving in the breeze. But I did not want the background to blur out too much. Then the sunsets are really stunning – even without filters or changing whitebalance. I think this reaction to sunsets is hard-wired in us as the body relaxes ready to rest over night. As well as pleasure in colours and contrast. But this sunset would have benefited from a tripod to give a bigger depth of field and greater sharpness in the middle ground. This was also one of the few images that did not have lens flare. Even the same crow looks quite friendly. Shot at ISO 125, 1/160 , f5.6. A tripod here would not have helped because the bird would have become more blurred. I was quite pleased with the sublime images. But I want to work more on them in post-processing to see if I can push the tones further in certain places to increase their impact. They were shot in aperture mode and aperture and shutter speed were somewhat reactive as the scene kept changing. It might have been interesting to have used a tripod and longer exposures to capture some of the movement. Some were at 400 ISO, with hindsight that could have been reduced to increase the quality of the images. The ‘beautiful’ images are much more conventional. Here I need to think much more about different approaches. But I was hampered by our lack of mobility – and the fact that we only had one sunny day. The other cloudy days were also much less dramatic than the first. Some interesting images, but not enough light for conventional beauty or enough drama/contrast for sublime. Subverting these concepts too much might make them meaningless. But maybe I should have just looked harder with a more open mind.